When Brian Kerr became Irish international manager, one of the first decisions he made in his own head was that the job would never define him. Instead, he would define the job. And he would be determined to succeed by demonstrating his ability as a coach, not his qualities as a human being. In fairness, it wasn't a difficult decision to make at all because that is how he had lived his life since beginning to coach teams as a young teenager. The job was one thing. His life was quite another. Which was why, on the weekend of his unveiling, he was so annoyed when a newspaper published a picture of his house in Greenhills and placed it in stark contrast to the lavish piles occupied by his contemporaries in the Premiership. The blurred lines of private and public arrested him. If anything, it hardened his stance and the more time he spent in the job, the more he forced himself - or was forced - to imperceptibly withdraw. The job was the only thing that mattered. 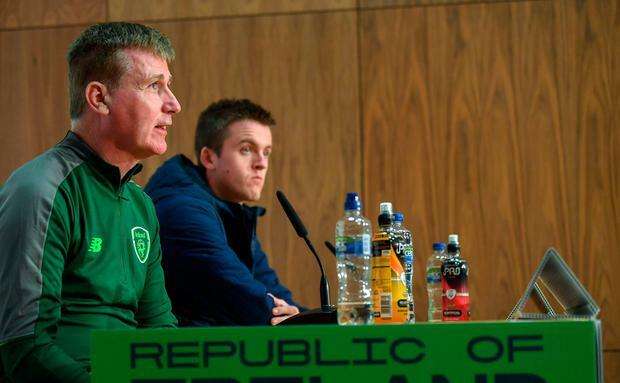 Stephen Kenny, as a disciple of Kerr, but for some time now very much his own man, will have spoken privately in recent months to the manager who gave him his first international coaching gig. But, being cut from the same cloth, he too will have understood the terms of engagement that await him now, as he begins his first real week of work in international management which will culminate in him assuming the top job in less than two years' time. While Mick McCarthy took his troops for training in Abbotstown yesterday morning at 11am on the main pitch, Kenny's U-21 charges went through their paces two fields away. Almost side by side. But their paths will diverge later this week as McCarthy takes his side on the road while Kenny's men begin their own qualification campaign in Tallaght. Gibraltar and Luxembourg are international minnows but of the managers who will tackle them this weekend, only one is perceived as a big fish. Kenny knows he is the junior man in the odd succession plan concocted by an embattled FAI before Christmas. Until that time, however, he will maintain his long-established pattern of constantly inquisitive investigation into how to unveil the perfect game. And he will also resist any attempts of those who are inquisitive of him. He has done so already and the reactions may have jarred with him. Now, away from the TV cameras and bright lights, he retains an introspection that belies an extended familiarity with the handful of people in the room, most of whom have known him for nigh on 20 years. Ask him how he feels to be starting work in his football suit - after all the happy-clappy PR stunts and photo ops and smiley handshakes with Mick and pleading FAI nods to their own sense of wondrous genius at how all this has turned out - and it's as if he has been charged with a bolt of electricity. He says nothing about himself and everything about the players he has just watched. For he knows the only thing that will mark a success in this job, never mind the one that follows it, is how capable he is of making the players believe in what he does, not in who he is. His approach is vastly contrasting to that of the senior manager and it remains to be seen how their methods compare but only time can reveal that story. 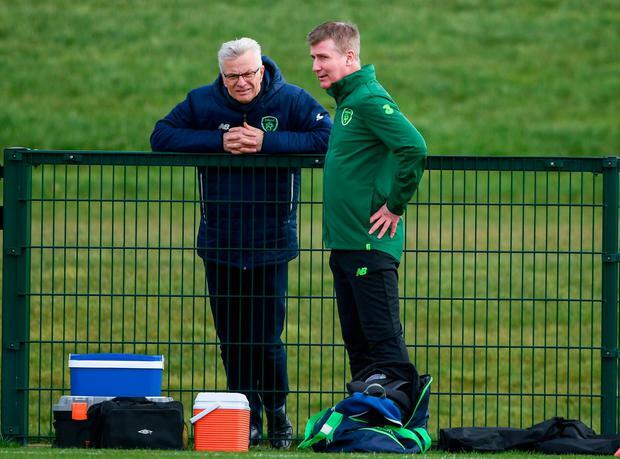 The intrigue that awaits in the short term are the inevitable comparisons which will be drawn between the two, particularly if the senior man struggles to overcome the obvious deficiencies that so exhausted Martin O'Neill's limited patience. Kenny can do nothing to prevent them so it makes sense for him to do nothing to invite them either. For now, he knows his place, even if the irony of it all smacks you in the face with all the force of a misdirected volley. He is the man charged with laying the pathway of development for the senior side - except he will be the man with the most to benefit. Working in tandem, albeit directly below, McCarthy provides Kenny breathing space but can conversely suffocate the senior man, as McCarthy himself discovered in the early days of his first coming when Kerr's Kids conquered Europe on the double. Nothing Kerr did amplified this sense; it was what his team were doing at the time and what McCarthy's weren't. History may or may not repeat itself; whatever does happen, nothing that Kenny says will amplify the white noise. Ask him again how it feels to have his feet under the table and he deflects. "Yeah yeah, I think, yeah I'm just very focused on this," he says, before digressing into how he watched a player the Irish public may not have heard of at a team they've never heard of via a coaching manual they certainly haven't heard of. He aims to end Ireland's miserable record at U-21 level and to do so in style; a dizzying explainer, left centre-backs passing to non-static right-fulls, tens and sixes in midfield being fluid, suddenly reveals the passion in the man. The football man. McCarthy places no such demands on himself for he has always lived life with his a**e in the bacon slicer; eight 1-0 wins with goals perhaps deriving from the rear ends of others (presumably not strikers) would suit him grand. It may seem like it's all a phoney war. But for Kenny, these baby steps will begin his path to the top of Irish football. And so he knows he must tread carefully. His players will do the talking for him.